Hey guys. I've been around these sites for quite a long time. Well, I just wanted to introduce myself. See you all around on the forum. Re: Altair3 here, ready to PUMP IT UP. Welcome To The Site. Please Have Fun Here And Help Us Advertise. Location : In The Under World With Eucliwood HellSythe. We Are Beast! 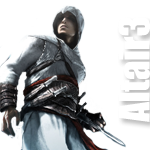 Welcome to CreativeArt Altair3, Glad to have you here!